Hi all... some of you might have noticed we put a few new pictures on here... that can only mean one thing- we are out in town where we have internet access. "The dr. explained that there are 3 levels of Cancer, 1-4 and Jo has #4, the worst level. They will start chemo on friday, but they are saying it will probably give her one to 2 years to live. I feel like this is so surreal. We will ask the Lord for a miracle, of course, but we know our times are in His hands. We send our love, Dad and Mom"
After that email we came out to town so that Jonathan would be able to call his family. When we're in the bush we have no phone access, so he hadn't talked to his family at all yet. He has been able to talk to Joanna, and his Mom and a couple of his other siblings, so we're thankful for this opportunity. 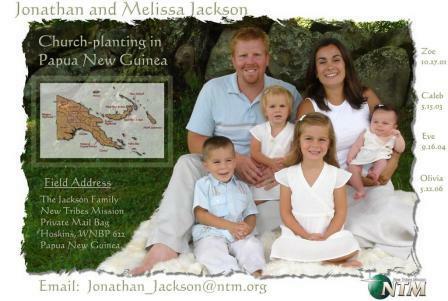 Please pray for Joanna, her husband Curtis and their three young kids, Natalie, Reuben and Kaylie. We know that nothing is too difficult for the Lord and the He can heal her! We know He loves her more than anyone, and His thoughts are precious toward His children! Pray that as Joanna and Curtis and the doctors try to figure out what course of action to take from here that they would have wisdom that could only come from the Lord. Thank you all for your prayers on their behalf! Eve is her Daddy's girl... reading Sports Illustrated! Zoe walking our newest addition to the family... our dog Rondo. Below the kids work on decorating their bags to hold thier pinata goodies! Olivia is swinging on a "rope swing" that is hanging under one of the village houses while Mom watches someone cooking over a fire! Underneath, Zoe and Landon enjoy their friendship. We hiked up with our whole team, searched for some water at a dry river bed, cooked hot dogs over a fire to celebrate Chris's birthday.